The formation of a BRICS gold marketplace, which could bypass the U.S. Petrodollar in bilateral trade, continues to take shape as Russia’s largest bank, state-owned Sberbank, announced this week that its Swiss subsidiary had begun trading in gold on the Shanghai Gold Exchange. Russian officials have repeatedly signaled that they plan to conduct transactions with China using gold as a means of marginalizing the power of the US dollar in bilateral trade between the geopolitically powerful nations. This latest movement is quite simply the manifestation of a larger geopolitical game afoot between great powers. Russia’s second-largest bank VTB is also a member of the Shanghai Gold Exchange. To be clear, there is a revolutionary transformation of the entire global monetary system currently underway, being driven by an almost perfect storm. The implications of this transformation are extremely profound for U.S. policy in the Middle East, which for nearly the past half century has been underpinned by its strategic relationship with Saudi Arabia. The dollar was established as the global reserve currency in 1944 with the Bretton Woods agreement, commonly referred to as the gold standard. The U.S. leveraged itself into this power position by holding the largest reserve of gold in the world. The dollar was pegged at $35 an ounce — and freely exchangeable into gold. 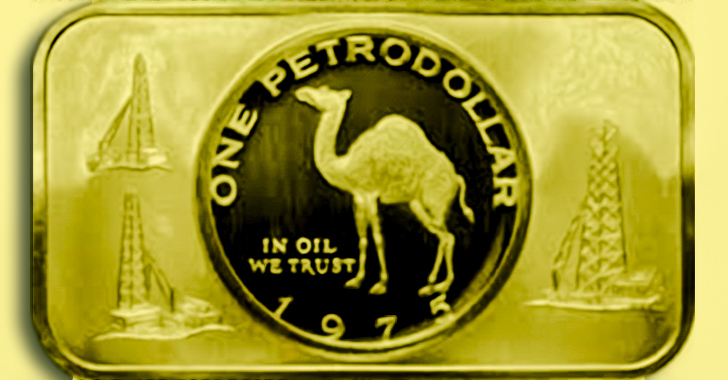 By the 1960s, a surplus of U.S. dollars caused by foreign aid, military spending, and foreign investment threatened this system, as the U.S. did not have enough gold to cover the volume of dollars in worldwide circulation at the rate of $35 per ounce; as a result, the dollar was overvalued. America temporarily embraced a new paradigm in 1971, as the dollar became a pure fiat currency (decoupled from any physical store of value), until the petrodollar agreement was concluded by President Nixon in 1973. The quid pro quo was that Saudi Arabia would denominate all oil trades in U.S. dollars, and in return, the U.S. would agree to sell Saudi Arabia military hardware and guarantee the defense of the Kingdom. In April, Sberbank expressed interest in financing the direct import of gold to India—also a BRICS member. Make no mistake that a BRICS gold marketplace could be used to bypass the dollar in bilateral trade, and undermine the hegemonic control enjoyed by the US petrodollar as the global reserve currency. “In 2014 Russia and China signed two mammoth 30-year contracts for Russian gas to China. The contracts specified that the exchange would be done in Renminbi [yuan] and Russian rubles, not in dollars. That was the beginning of an accelerating process of de-dollarization that is underway today.” according to strategic risk consultant F. William Engdahl. This entry was posted in Oil and tagged Chian, gold, petrodollar, Russia, Saudi Arabia on July 20, 2017 by Bone Fish. (ZeroHedge) Sir Richard Branson once said that the quickest way to become a millionaire was to take a billion dollars and buy an airline. But, as EnerVest Ltd, a Houston-based private equity firm that focuses on energy investments, recently found out, there’s more than one way to go broke investing in extremely volatile sectors. As the Wall Street Journal points out today, EnerVest is a $2 billion private-equity fund that borrowed heavily at the height of the oil boom to scoop up oil and gas wells. Unfortunately, shortly after those purchases were made, energy prices plunged leaving the fund’s equity, supplied primarily by pensions, endowments and charitable foundations, worth essentially nothing. All of which leaves EnerVest with the rather unflattering honor of being perhaps the only private equity fund in history to ever raise over $1 billion in capital from investors and subsequently lose pretty much 100% of it. Only seven private-equity funds larger than $1 billion have ever lost money for investors, according to investment firm Cambridge Associates LLC. Among those of any size to end in the red, losses greater than 25% or so are almost unheard of, though there are several energy-focused funds in danger of doing so, according to public pension records. EnerVest has attempted to restructure the fund, as well as another raised in 2010 that has struggled with losses, to meet repayment demands from lenders who were themselves writing down the value of assets used as collateral, according to public pension documents and people familiar with the efforts. So, who’s getting wiped out? Oh, the usual list of pension funds, charities and university endowments. A number of prominent institutional investors are at risk of having their investments wiped out, including Caisse de dépôt et placement du Québec, Canada’s second-largest pension, which invested more than $100 million. Florida’s largest pension fund manager and the Western Conference of Teamsters Pension Plan, a manager of retirement savings for union members in nearly 30 states, each invested $100 million, according to public records. The fund was popular among charitable organizations as well. The J. Paul Getty Trust, John D. and Catherine T. MacArthur and Fletcher Jones foundations each invested millions in the fund, according to their tax filings. Michigan State University and a foundation that supports Arizona State University also have disclosed investments in the fund. Luckily, we’re somewhat confident that at least the losses accrued by U.S.-based pension funds will be ultimately be backstopped by taxpayers…so no harm no foul. This entry was posted in Banking, Oil, Oil Bust, Permian Basin, Texas and tagged EnerVest, private equity on July 17, 2017 by Bone Fish. .. resulting in drastically lower all-in break evens for most US shale regions. This is the key ingredient of what Goldman calls the shift to a new “structural deflationary change in the oil cost curve” as shown in chart above. As such, there is the danger that tighter conditions will finally remove the structural pressure for lower prices. However, judging by recent rhetoric by FOMC members, this is hardly an imminent issue, which means Saudi Arabia has only bad options: either cut production, prompting higher prices and even greater shale incursion and market share loss for the Kingdom, or restore the old status quo, sending prices far lower, and in the process collapsing Saudi government revenues potentially unleashing another budget crisis. This entry was posted in Housing, Oil and tagged Oil Field Housing, Shale Oil on March 21, 2017 by Bone Fish.